Finally, a day to spend a few hours in the dye studio. I have been wanting to try the process of "Iced Parfait" since I read in the the June/July 2012 issue of Quilting Arts Magazine. The article was written by Carl Ludington. 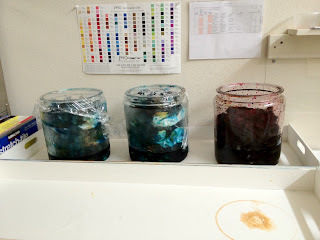 You all know I love to ice dye and my other style is parfait dyeing, so it just makes sense to combine the processes. Two of the vats are in colors for our bedroom quilt, that I keep changing my mind on how it is going to look and be constructed. 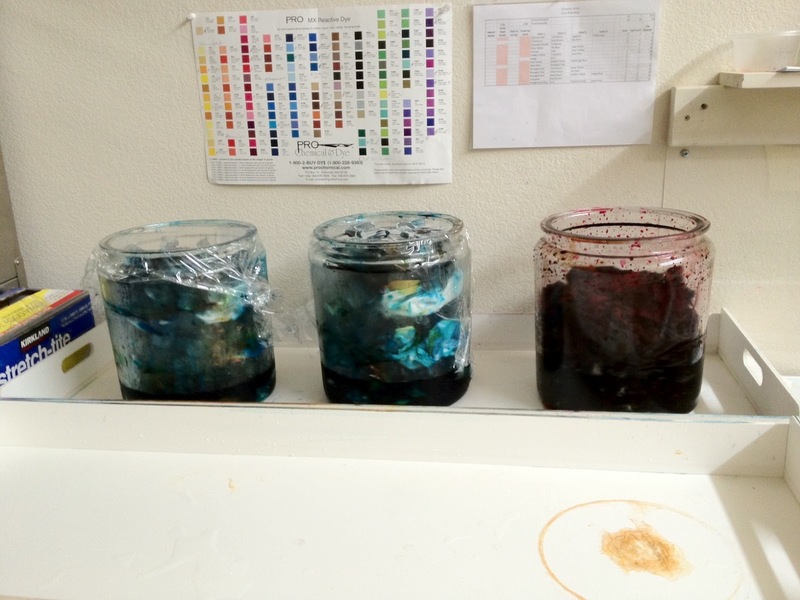 The third vat is of old dye that was in my dye refrigerator. These dyes have been sitting in the fridge for months, so I don't know strong the colors will come out. I just threw in diaper flannel to see what happens. If they don't come out well I will use the diaper flannel as batting in my art quilts. This morning I also discharged the last of the pink silk in my stash, about 4-5 yards. Since I emptied the icemaker this morning, on the iced parfait dyeing, the silk will have to wait until tomorrow to be dyed. Have to let that icemaker catch up with my dyeing habit. I am going to make a new blouse of the silk and use one of my current tops as the pattern. I found the top in a shop in California, it is lightweight linen, cut on the bias and the most comfortable and flattering top I own. 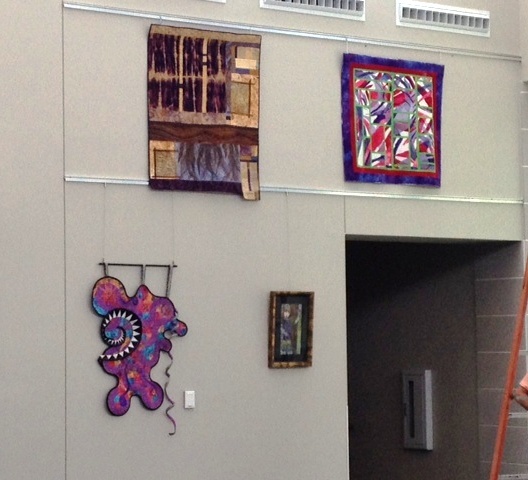 Yesterday I was honored to help hang the latest show for the Dallas Area Fiber Artists. 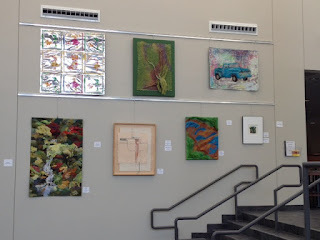 The show is at the Lovers Lane United Methodist Church in Dallas. Beautiful church and gallery area. The Dallas Area Fiber Artists never cease to amaze me with how all of our varied styles and processes work together in a show. 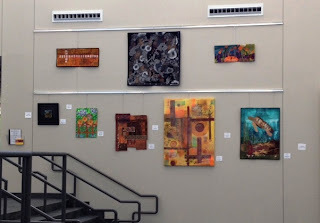 Here are three of the walls of the show. I didn't get a picture of one of the wall. Check the DAFA website later for all the pictures. Okay, time to get back to the studio and start drafting my pattern.